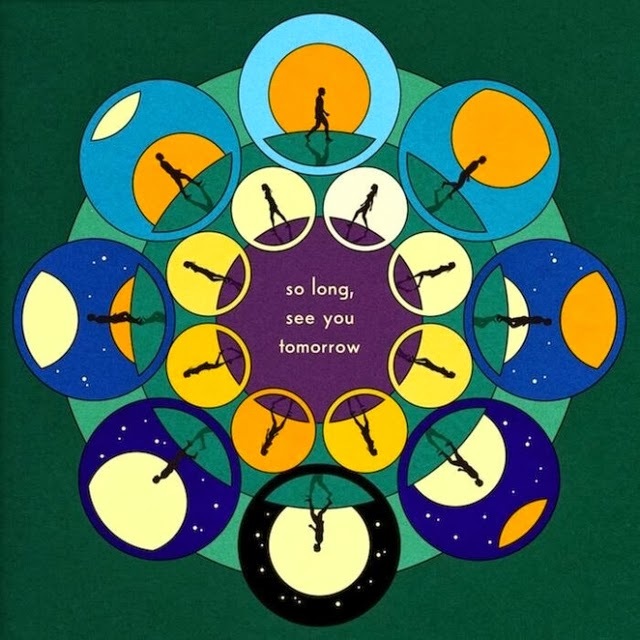 Okay, I challenge anyone to find me a pubescent teenager who is still yet to hear the name Bombay Bicycle Club. Pretty hard huh? Whilst maybe not your David Beckham and Spice Girls bedroom-wall poster adorning Gods the North London band have charmed their way in to the hearts of our music loving youth in the most righteous of ways. Since their debut 'I Had The Blues But I shook Them Lose' was released in 2009 they've gone through quite the change in sound as they leave behind the jingle-jangle Indie-Pop guitars in favour of greener pastures. With a further 3 records in tow each progressing and building on their previous successes not only has their audience expanded but so has their music as we come up to date on what looks set to be one of 2014's most anticipated album's 'So Long, See You Tomorrow'. From all that's aired so far it would seem Jack Steadman and Co are looking at their most departure-esque release to date as their sound takes to a whole new mould. The overall buoyancy of 2011's 'A Different Kind Of Fix' is still present along with the whimsical acoustic nuances on 'Flaws' but this new hybrid has a far more superior edge. Bursting joyfully in to life with opener Overdone, as if awakening a puppy from slumber that has nothing more to do than play, the mood gets set from the onset. As cinematic swirling synth notes give way to a vast pallet of giant guitar stabs and break-beat percussion you get a true sense of feel good motion. Speaking of the record Steadman explains "I think there is a romantic side to it, although I always try to leave the meaning side of a song and theme wide open." and that's evidently clear on It's Alright Now as he blurts out "Is this the place where it all stems from, Where it had every right to become, Step away step away stay numb". With lead single Carry Me heading up the most rave-ready track on the record with its empowering sinewing basslines its Home By Now we where we get the first taste of Jack's flamboyant travels as he escapaded around the world picking up influence from a whole range of cultures, all audible as samples collide head-on in a Hip Hop meets Folk-centric aura. Meanwhile, Whenever, Wherever (Must. Avoid. Shakira. Based. Pun) gets all electronic. Catching you off guard with an expansive softly sung intro and sparse piano keys the track suddenly explodes in to a pulsating, dancefloor ready masterpiece. As it reaches its climatic peak the electronics begin to fall out as the band's more familiar percussion and guitars override its sound. If you were looking for an Always Like This replacement, then this might just be it. Whilst Luna takes us over the half way point on a wave of euphoric glittering synths and guitars rising in to one gorgeous crescendo Eyes Off You slows the pace to a gentle breeze. A dispersed and eerily cold landscape lays before until Lucy rose's backing vocals come to the forefront as skippy percussion seeps through. Having globetrotted half way around the world whilst penning 'So Long...' it feels only natural for this record to ooze with the conglomerate urgency one would expect from such rich and diverse inspiration. You really begin to get a sense of this on Feel. As buzzing synths begin to allure with their snake charming way, the carnival-esque vibes running throughout goes to show just how wide range the band's musical soundscapes can reach. Elsewhere the pace becomes more melodic and chilled with the polished Come To acting as the perfect breather as you picture glitter raining down from the ceiling taking you on a journey to an imaginative star studded life. As a plinky looped sample leads us in to the albums finale sitting ever so comfortably under Steadman's rhythmic notion, the track slowly but surely begins to pick up pace as it swings in to action. As they experiment with electronics once more innovative drum patterns begin to take hold before dropping you in to an ocean of jovial self-indulgence. Go on, treat yourself. You most certainly deserve it! Whilst 'So Long, See You Tomorrow' feels a million light years away from their debut all them years ago it's still so scarily lifelike in both texture and direction. Yet with ever evolving stylistic influences it's managed to not only branch off but form a whole new life form rooted deep within its growth. Taking the best picks from all 3 albums number 4 looks set to be a true commandeer that will no doubt stand the test of time. Their most audacious effort yet looks set to pay off tenfold. The new album will be released February 3rd 2014 via Island Records. You can Pre-Order it here and gain It's Alright Now as an instant download. The band will be out on the road in March in support of its release. You can see a full list of dates below.